Several years ago I overheard a conversation in a restaurant that was so provocative I could not help first listening in and then eventually horning in. It was late on a Sunday morning. In the booth over my left shoulder was a man who said he was a LDS bishop and his friend. They were discussing the service they had just attended at the largest church in Arizona. Fascinated at his viewpoint, and being aware that the Mormon church is still growing while Protestant numbers are waning, I turned around and engaged him in conversation over coffee -mine, not his. -You make takers. We make givers. -You are entirely focused on the individual. We focus on building a community. He then described our churches as market-driven and led by focus groups rather than convictions. He called out two things in particular: Segregating our age groups and catering to people’s preferences. Catering to preference: “And another thing. You do music people like, with bands. We do bad music, sometimes on an out of tune piano, led by a retired music teacher. Our music is weird. It teaches people that they are part of something different from the world. We make people who give rather than take and who know they are different and are part of a set-apart community. You blur the line between the church and the world. We emphasize it. Surely he had very little expectation that the gathering of Christians is to worship the triune God and bring him glory. 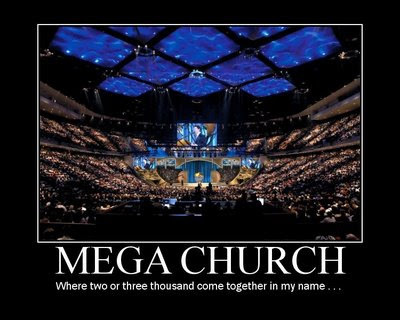 But does the mega-church? Is there a back door wide-open filled with people inoculated against the very Gospel our mega churches work so hard to communicate? Have we created a cult of the individual rather than a community of givers? Please do not read my critique as an indictment on motives or on size per se. There are large churches working hard to be about others (see: www.mission68.org). The mega-church people that I know want to honor God and reach people for Jesus Christ. However, I fear we have embraced an ethic of short-term pragmatism. The mega-church has embraced a biblical message divorced from biblical and historically Christian methods. This is dangerous territory. Next up: Why the “Saddleback movement” works for the over 30 but not those under it. And, Potential ways forward for both the church and the youth program. Indeed. But interesting. It was like 8 yrs ago. At the time I had never heard anyone critique where we had gone. There’ll be plenty of religion around (Mormonism, Islam, ‘self’-focused Christianity, etc.). But faith is a whole nuther matter altogether. I found your blog from a friend’s Facebook link to “What’s so uncool about cool churches?” I thought you had some insightful and fascinating points, so I continued reading entries and this one grabbed my attention. I’m LDS and like many churches we are concerned about the youth. In 2013 our church will implement a new teaching model that aims to help the youth more effectively become true disciples of Christ. Here’s the intro… http://www.lds.org/pages/new-youth-curriculum?lang=eng I wish you well in your efforts. The world needs our Redeemer now as much as ever. Thank you, Melissa. Thanks also for reading around my blog. I thought your bishop was fascinating. It took me about 4 years to realize the wisdom of what he was saying. I will check out your link. Thanks for including it. Again, excellent post. I think you and I would get along very well. Pax tecum. My parish is growing largely because folks from the local mega-church are expressing all of these frustrations. Of course, most people who go out the back utterly disappear, but a few make their way in this direction. The biggest challenge is to try to help them overcome their profound resentment once they realize how much they were duped by the movement. Interesting article. As a worship pastor, you can imagine that I take exception to the LDS bishop’s issue regarding worship. Presenting bad worship via the form of music, is like bringing a Cain offering before the Lord. The Bible is so clear that God calls on worship leaders to be skillful. In fact, artisans of all walks throughout scripture were called upon to use skill (in fact there was a lot of ‘WOW’ factor in what they did. Bad music, just puts more an emphasis on those performing bad music (very distracting), taking the focus of The Almighty. Certainly, there are ‘bands’ in the modern church that are just putting on a show, but this gentleman seems to be applying his critique universally, which is in error. Ultimately, Christians are referred to as a Royal Priesthood, and the levitical role of a priest was to minister to God. What an awesome privilege, as well as a daunting task! Excellence in worship, along with a heart passion to lead people into the Throne Room of God, into His very Presence, should be our highest goal (as a worship leader), and excellence allows the ‘band’ to get out of the way, drawing folks in so right where they stand, they too can minister to the heart of God, can experience His Presence, and in turn have an encounter that is life changing. They can leave His Throne Room, prepared to be the ‘givers’ the bishop referenced. Certainly, the gentleman wasn’t totally incorrect with his overall statements, but all to often (these days) I see more and more statements and condemnation regarding modern worship, and felt I needed to respond. I definitely appreciate your post, as it was thought provoking. Continued blessings on your ministry. Nice to have a worship leader in the conversation! I certainly do not want bad music any more than you do. We want to give God excellence as a response of worship…although there is a move to pare back, such as Deliberate Simplicity. That post was a while ago, but I think the point I was trying to communicate was that the LDS tend to make people who are committed to the community by being a) intergenerational and b) different from the world. I flesh out the idea of difference more in “O Yeah, what I wish i’d have said…” earlier this week and another one on “why the big box works for the over 35 back in like October. Blessings in you bring praise to God with your stringed instruments and your keyed instruments. I also want to point out that Mormons regularly convert from the ranks of other Christians. Christians don’t convert other Christians. We don’t send missionaries to our Christian friends houses. Why? Because we see a like faith. Someone needs converting when they do not share a like faith. So I see the Mormon insistence that we share a like faith while sending missionaries to my home to be a bit underhanded. Mormon Bishops don’t frequent public restaurants on the sabbath day. That’s all I’m going to say. Hi Chris. That is interesting. The one gentleman said he was a bishop and it was the Marie Callendar’s on 43rd Ave and Bell Road in Phoenix. The guy who said he was a bishop wasn’t eating, though that doesn’t account for his whereabouts if there is an LDS prohibition against bishop’s frequenting restaurants on sabbaths. You seem to be versed on this, Chris. To your knowledge, were they just his or did they represent a broader impression of leadership at the time (it was more than a decade ago)? Btw, More than a few people employed by megachurches are now making similar critiques.